DES MOINES, Iowa – A series of furious tornadoes hit central Iowa on Thursday (19th July), putting buildings to the ground, forcing the evacuation of a hospital and injuring at least 17 people. 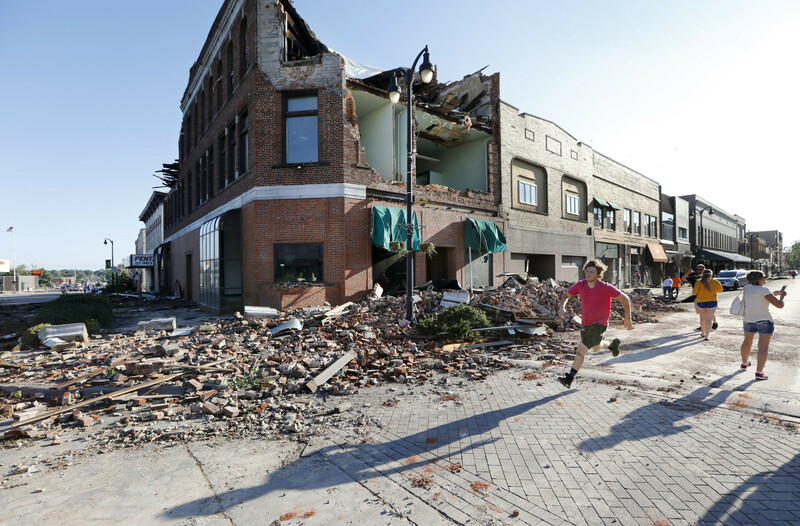 Marshalltown, a city housing 27,000 people received the hardest hit from Mother Nature as brick walls collapsed, roofs flew through the air while the courthouse’s historic cupola tumbled 175 feet to the ground. In another part of the state – Pella – a tornado swept through an agricultural machinery plant as people were working, resulting in at least seven injured people. Lt. Shane Cox said that the injured were rushed to the hospital and treated for minor injuries. The factory was hit by the tornado around 4 p.m. local time. Unfortunately, one of the factory’s manufacturing buildings suffered severe damage, as metal strewn across the parking lot and even onto the street into a cornfield. Vehicles were turned upside down and piled onto others. The company officials are assessing the damage. Thankfully, the plant activated its storm warning system and workers immediately left to take shelter as the storm hit. Even though they were able to hear all the booms and crashes and glass shattering sounds, they were safe. The storm seems to have moved east and north.